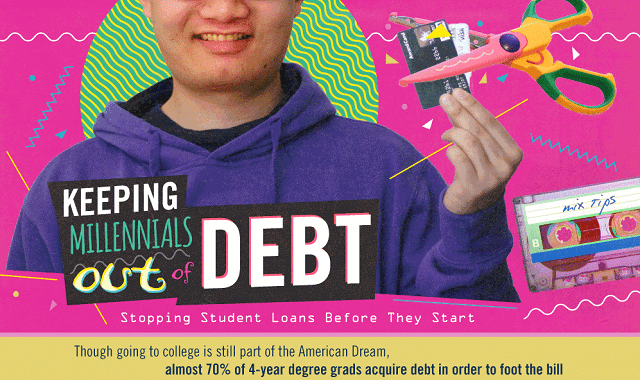 Keeping Millennials Out Of Debt #Infographic ~ Visualistan '+g+"
Much like the housing bubble that burst a few years back, the student loan bubble is heading in the same direction in the United States. Student loans were supposed to make it easier for kids to go to college. But what has actually happened is that student loans have driven up the cost of college to the point that no one can afford to go without taking out loans. Now there is a new generation of college graduates burdened with debt who can’t pay their bills and are in default. There are a few things you can do to avoid student loan debt. First, save money for college before you go. Look for a work-study program that will allow you to work in exchange for your tuition and your room and board. The less debt you have when you graduate, the sooner you can get on with your life. Learn more about avoiding student loan debt from this infographic!